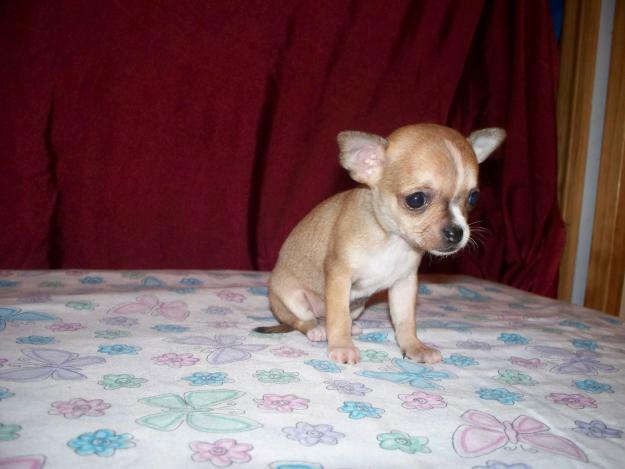 You are currently browsing the The Pet Product Guru blog archives for May, 2013. This story absolutely sickened me. 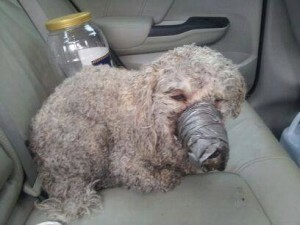 This dog was found beaten. The sick individual put duck tape around its mouth and left it to die. This is really deep seeded evil. So many innocent animals are found abandoned or beaten. How can anyone hurt an innocent animal? If this disgusting individual ever gets caught, the authorities should beat this person, place duck tape around this person’s mouth and leave him/her to die. Sorry but this kind of thing really gets to me. Some people don’t deserve to live. If you see an abandoned dog, please do something to try to help it. Take it to an animal shelter or animal hospital. You’ll feel really good about about helping rescue a pet in crisis.. If you suspect animal abuse, call the police or animal rescue right away. Be persistent and put an end to this sick deviant behavior! Listen to the Edgewater Internet Radio Network all day at work. Listen to our great radio stations at work on THE EDGEWATER INTERNET RADIO NETWORK. Select from Country, Oldies, 70’s and 80’s. Soft Rock, Dance and American Popular Standards. Great music all the time! If you are going camping this summer and intend to bring your dog, you must be prepared and follow the rules. Make sure that your dog is trained and follows your commands. Respect the other campers. Keep your dog on a leash or make sure he is restrained. Control his barking and always clean up after him. Remember that other campers will also have their pets along so make sure that you keep your dog a safe distance away from them to prevent a loud dog scuffle. Be careful, keep your eye on your dog all the time and never let him run loose. Here are some general tips to follow when camping. • OBEY” “QUIET TIME‐ Be a good campground neighbor. Don’t make loud noises, especially at night. Posted quiet hours are typically from 10 p.m. – 6 a.m. At other hours, limit the use of generators to no more than one hour at a time. county roads. Drive all vehicles slowly through campground loops and watch closely for pedestrians. 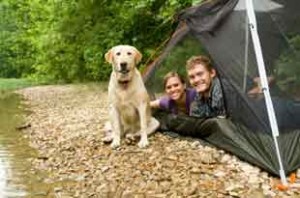 • DOGS ‐ Dogs must be leashed or otherwise physically restrained in campgrounds. Do not allow pets to harass visitors, dogs or wildlife. Do not leave pets unattended. Control barking. • CAMPFIRES ‐ Campfires must be inside fire grates provided at campsites. When no one is physically attending a campfire, it must be put out completely. Pour water on the fire and stir ashes until there is no smoke. Fire restrictions in effect will be posted at the entrance. debris behind. Leave your campsite clean when you depart. plants alive. Leave wildflowers for others to enjoy. ENJOY INTERNET RADIO ON THE EDGEWATER INTERNET RADIO NETWORK. lISTEN TO OUR SIX GREAT STATIONS AND ENJOY! Well, I finally made it down to Rehoboth Beach for the Memorial Day weekend. On Friday, I packed the car, and put my cats in their carriers and headed down from Edgewater, NJ. It’s a 218 mile trip which should take about four hours. It was 1:45pm when I hit the road. As soon as I got on the New Jersey Turnpike (or as I call it “turnpike to hell”) I realized that this was going to be a long trip. It was longer than I expected. The road was lit up with red taillights from the beginning to the end. It was a grueling trip. A real nightmare! I crawled and crawled. 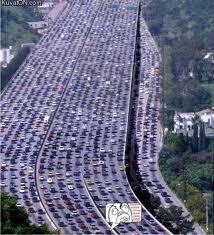 The relentless traffic just wouldn’t let up. I cursed NJ, the rotten turnpike and everything that I could! The four hour trip took over 7 hours!! You can give a dog water and food during a long trip to prevent dehydration but cats usually will not eat or drink anything while traveling. It was now past 9:00pm and Mollie and Millie did not have anything to eat or drink for more than seven hours. I set out their food and Mollie began eating and eating and eating. About a half hour later, I noticed that she was drinking a lot of water. Much more than usual. A few minutes after that, she made a very loud, strange noise. It sounded like she was in pain. I panicked! She then began to vomit and vomit. I got very concerned but it seemed like she was fine after the vomiting stopped. She is now fine, eating and drinking like normal. I attribute her upset stomach will the fact that she was dehydrated and ate much too fast. I curse the New Jersey Turnpike with all of its construction and horrible traffic. It makes traveling in New Jersey very frustrating. Keep this in mind when you travel with cats. Maybe you should leave late at night so you don’t run the risk of sitting for hours and hours in relentless traffic and if you can, avoid the New Jersey Turnpike at all costs. It is really terrible! Remember, your pets count! Listen to our radio stations all weekend long. Summer music is back on Edgewater Radio. It’s THE EDGEWATER INTERNET RADIO NETWORK. Another holiday weekend is here and many of us will take to the roads and take our pets with us. 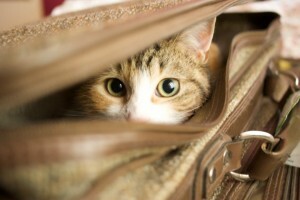 We love to travel but do our pets? My older cat Mollie, once feared and hated her cat carrier. As soon as I would take it out, she would hide. This delayed the start of what was to be a great getaway weekend. When I did finally find her under a bed, in a closet or cabinet, iIt was difficult getting her to go inside the carrier. She would resist and I would have to practically shove her inside! I have a weekend home in Delaware which has a screened in porch. I would leave her cat carrier on the porch with the door open. She loves going on the porch and eventually would go into her carrier and take a nap. I would frequently give her a snack in the carrier. Now, she no longer fears her carrier and spends many hours inside when it’s on the porch. If you bring home a new kitten, try to get her used to her cat carrier right away. Keep the carrier within your cats sight with the door open, put in a soft blanket and some of her favorite toys. Feed her inside the carrier and before you know it, getting her inside will no longer be such a chore. Good luck and have a great Memorial Day Weekend! Many people are very proud of the college that they attended. Especially if they stuck it out for the full four years, it’s very likely that they have all kinds of apparel that lets the world know exactly where they attended. Some of the most common college-related apparel items are sweaters, t-shirts, slippers, and more. But these kinds of items shouldn’t just be enjoyed by you. Rather, they can also be proudly displayed on your pet. These college logo bearing dog sweaters are especially cute and meaningful if you had your dog throughout your college years. Although the dog clothing market is dominated by items for small dogs, they are often available in many different sizes. So whether you have a Chihuahua or a German Shepherd, you should be able to share your college pride with the entire family! Listen to six different internet stations playing the most variety on the EDGEWATER INTERNET RADIO NETWORK! A Legislative Solution for funding the Spaying and Neutering is now in Place in Several States but BIG Business Would rather be Greedy!! Does it Surprise You? If we reduce the number of dog and cat litters, we will reduce the number of suffering and homeless animals. Several states have created and expanded state spay/neuter programs. Maine successfully has the program in place and other states are following it’s lead. Unfortunately, state bills to create the programs are facing still opposition (from all industries) the pet food industry. A state-levied surcharge on pet food is used to finance a spay/neuter program. The pet industry fought against this in the state of Maryland but they lost. The Maryland bill passed in APril 2013. The surcharge works by requiring pet food manufacturers pay an annual $100 registration for each brand they sell in a particular state. This will bring about $1million dollars yearly to fund spaying and neutering. If the pet food industry chose to pass this expense on to their customers, it would cost cat owners a mere 26 cents and dog owners 50 cents per animal per year. This should be a no brainer. A pet food surcharge is a reliable, substantial and sustainable source of revenue to fund state run spay/neuter programs. 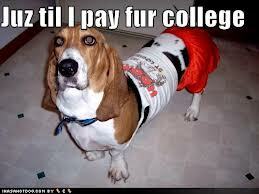 Pet owners are willing to pay pennies pet year to greatly reduce animal suffering. What’s the problem with the big pet food companies. 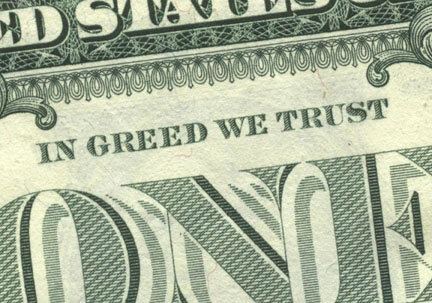 This country runs a greed!! It’s really a shame! The way people think in this country is truly unbelievable!!! Listen to six great internet radio stations on our internet radio network. THE EDGEWATER INTERNET RADIO NETWORK!! Was your dog rescued from a cruel environment? Does he or she exhibit anxiety or deep rooted fear? Whether your dog was rescued from a puppy mill, cruel environment, pet hoarding or some other situation, there is help out there. The Behavioral Rehabilitation Center offers programs for pets where you can even create your own program like systematic desensitization and counter conditioning. These are two common treatments for fears, anxiety, phobias, aggression or any behavior problem that involves arousal or emotional reactivity. These treatments are designed to change the way your dog feels about something – like new people or loud noises. It is much easier to do this with a qualified behaviorist. You can visit the Virtual Pet Behaviorist for more information. The weekend is here! Enjoy any of our six great radio stations by going to THE EDGEWATER INTERNET RADIO NETWORK. A Dog Thundershirt. Does it Prevent Anxiety? 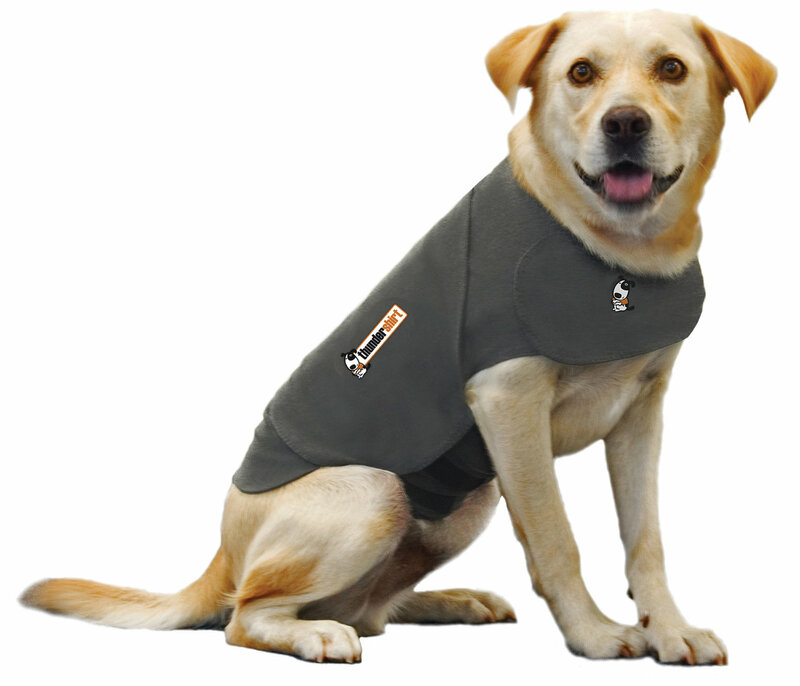 A dog thundershirt is designed to help prevent anxiety in your dog. Thunderstorms usually cause lots of anxiety in our canine friends thus came the name “thundershirt.” This shirt is designed to provide a calming effect when your dog experiences fear, general or separation anxiety. The shirt is fully adjustable for a snug, comfortable fit. The shirt delivers constant, gentle pressure to create a calming effect. It supposedly has a proven success rate of 80%. The experts at Petsmart say that the shirt is ideal for fear and anxiety relief from thunder, fireworks, separation anxiety and travel. It’s made from a lightweight fabric and they cost about $40.00. So do they work? You’ll have to try it and let me know. I tell you one thing, it can’t hurt and may be worth a try. I read a very disturbing article the other day. 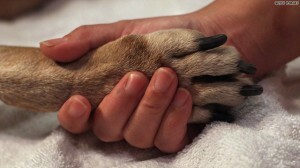 Did you know that about 5 to 7 million companion animals enter shelters every year and 3 to 4 million are euthanized! (60% are dogs and 70% are cats) These statistics are staggering! More than 20 percent of people who leave dogs in shelters adopted them from a shelter. Lets face the fact that many people should NEVER own a pet whether it be a dog or a cat, it doesn’t matter. 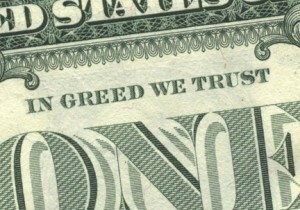 I hate to say it but we are a very selfish, self centered society. Many of us don’t have time to spend with a pet. Work and a social life rules. Also many neglect to realize that owning a pet requires patience, and flexibility. Yes, there is a possibility that a piece of furniture may be ruined but does this justify taking the pet back to the shelter only to be euthanized 72 hours later. Come on, show some compassion. Would you put your child up for adoption if he accidently spills something and ruins your rug?? Prospective pet owners must be prepared to face some challenges ahead before adopting a pet. If they can’t or don’t expect anything to change, then don’t even consider adopting. So many people adopt dogs of cats because their child wants a pet. Many of these people have no clue of how to care for the pet but because their child is insisting, crying, whining or whatever, they give in and who suffers? The poor pet. Come on people, use common sense, be considerate of our furry friends. They truly deserve a good life and if you can’t give them one, then let someone else give them a good life, love and affection. Sorry if I offend anyone but this is a fact, there are too many inconsiderate, selfish people out there!! Six great radio stations on THE EDGEWATER INTERNET RADIO NETWORK.